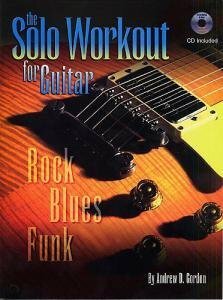 The Solo Workout for Guitar by Andrew D. Gordon can be used by any guitarist who wants to improve their improvisational skills in Blues, Rock & Funk styles. This product consists of 15, 3 minute rhythm tracks so that any musician can try out soloing ideas while playing along to a rhythm section of drums, bass, guitar and keyboards. There are 4 Rock Grooves, 6 Funk Grooves and 5 Blues grooves played in different keys and tempos. The book shows the chord progressions used in each of the examples as well as 10 soloing ideas for each Groove (all recorded on the CD) totalling 150 phrases or riffs. The best way of improving one's improvisational skills is to play with other musicians, however if no musicians are available then this product would be the next best thing. The book contains both standard music notation and tablature. To purchase the physical book please go to our publishing company's website A.D.G. Productions.